Massage Therapists, Osteopaths, Physiotherapists, Psychologists, and any other medical profession. $27 per month and $0.10 per sms credit. 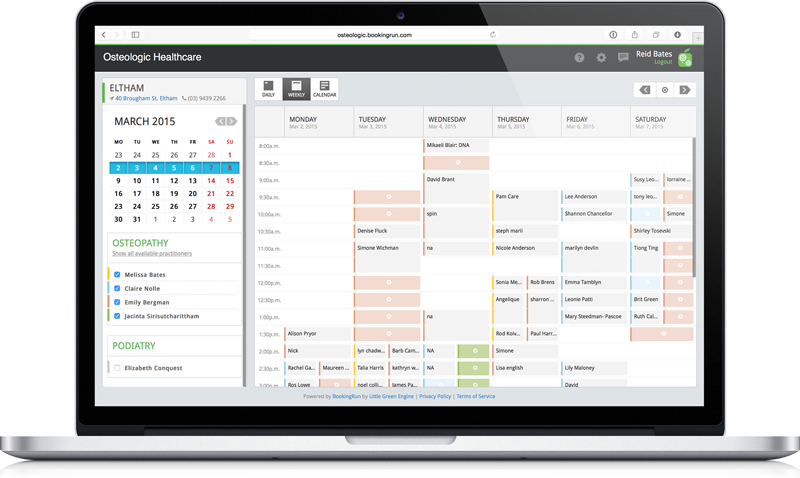 Web-based system for healthcare businesses that helps with appointment scheduling and automated booking processes. Overall: I do not use all the features. I use it predominantly for reminder messages. Not all of our clients are even privy to the fact they can book online (which works for us that they don't). I will start using the mailing features. Used Clinicalendar before from same developer - DISASTER ! Overall: Working well, until without notice one day I was charged for texts, but NONE were received by the customers , which created complete chaos in the clinic. I waited days on end for contact from support and was eventually told the 'telco companies ' in NZ were to blame - funny that was never a problem before ! Recommendations to other buyers: Respect your customers and don't just take their money. 4. add notification email for booking cancellation. The available hours was easy to set up, as were some of the general settings. I have about 5 Services and when I created them the list seemed to go off the screen/Calender page. I tried to delete them but cant. It would be good if the format allowed for more services without the viewer having to scroll down the page, perhaps a smaller font size? Tried several times to log in without success, the system would not recognize my user name and/or password, finally it did. Could not figure out why?? Had an initial welcome but no replies to my emails. couldn't find the answers to questions in the help menu. I thought it was easy to use, but my clients couldnt understand how to book a consult. Comments: I like the emails asking how things are going - although i wrote back asking for some help regarding the calendar and i didn't get a response. My hour consults were divided into 15min blocks initially, now 30min blocks, and it was hard for my clients to understand through email they had to click on the first box of the hour block to book otherwise it wouldn't allow them enough time. i went back and forth with emails about it. I wish i could personalise the text messages my client received. Overall a good experience but it could be a little better. Comments: This has been great to get started. I love the booking feature and that you can send reminder emails and texts. I love that you can have multiple logins and ultimately open it to the public. The emails were great. The text messages that came through did not make scene to my clients. For whatever reason there were lots of symbols rather than a clear concise message. This is disappointing as a feature I would like to utilize however its not professional. If you would like 45 minute appointments, you just need to change your calendar interval to 15 minutes. Here is an article explaining how to do this. Comments: Booking Run is easy to use, has an elegant interface and is very cost effective - perfect for start ups or established businesses. I especially love that I can ask my clients to book themselves in at their convenience and they get an email/SMS confirmation of the booking and then a reminder SMS the day before their appointment - fantastic! The software is scalable so can grow as your business grows. Comments: So simple, our clients love it. We tried a number of services that tried to do everything. Either my staff or my clients found every one of them too difficult to use. BookingRun is simple. It does one or two things VERY well and our clients actually prefer to book in this way. Can't beat the price either. Comments: Integrates well with my calendar, limited use with free version. Not sure if clients can save their details for use next time. Notifications were good but again not sure if format can be changed on paid version. I find this excellent to use compared to other programs. Simple and great for small business. Comments: I am having trouble with booking clients in as the 'appointment type' with greyed out and you can not enter clients!! Very frustrating and have spent hours trying to work it out. I have sent an email over a week ago requesting help but I have heard no reply. Very easy to use. Saves my time as I don't need to reply emails or messages back and forward. Comments: Very easy to use. Saves my time as I don't need to reply emails or messages back and forward to book appointments. Comments: I was trying to add credits so I can send out reminders but cannot see where I can do this. I raised a ticket but there is no support so unless you want to send out your reminders manually I would not recommend this product. If they fixed up the customer service it would be a good product as it is ok to use. Can't reach customer service at all!!!!!! !